Congrats! 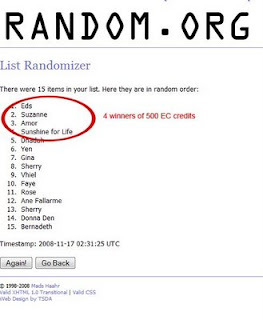 You won 500 EC credits, please leave your EC profile URL so I can send you the credits. Tama ba tng binigay ko? @JennyL, sige po pass nyo po kay Dhadha yung prize ko. Next time na lang po ulit, hehe. YEHEY!!! Thank you ats! Which reminds me na hindi ko pa naibigay ang wins ng winners of Yen's contest. Ngeek! congrats on the contestants who have won! oh well, maybe i'm not lucky enough. @Bernadeth there's still chance to win for the contest :) its not over yet.